Bus from Shah Alam to Butterworth remains the most preferred mode of transport to connect people between the two cities. The direct express bus service from Shah Alam to Butterworth saves the passengers' time from travelling to Kuala Lumpur TBS, KLIA, KLIA 2 or Subang Airport for taking bus or flight. 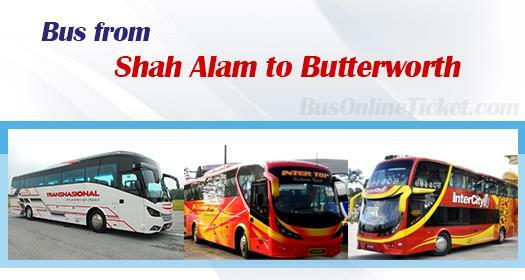 There are many express bus company offers the bus from Shah Alam to Butterworth. Transnasional and Intercity Coach are the only players providing the service under own brand counter. Other players like Billion Stars Express, Era Mesra Express, City Holidays Express, Cepat Sedia Express, Persada Express, KPB Express, Hatyai Intertop Express, Shamisha Express and Super Nice are providing the service under the management of agents in Shah Alam. Few popular agents in Shah Alam are DSM Bersatu, Hidayat Sutera and Masa Kini Resources. The first bus service for this route starts from morning 9.30am and the last bus service leaves the Terminal Bas Sementara Shah Alam Seksyen 13 at 11.59pm. The duration required for bus from Shah Alam to Butterworth is approximately 4 hours depending on traffic and climate conditions. The bus fare for bus from Shah Alam to Butterworth is about RM 36.70. Washroom break will be provided upon request to driver during the journey. The drop off point in Butterworth is located at Penang Sentral Bus Terminal, also known as Butterworth Bus Terminal. Penang Sentral Bus Terminal is situated at the town center, right next to the train station and the ferry terminal. Butterworth is a place surrounded by many famous tourist attractions such as Penang Bird Park, Prai River Bridge, Taman Selat Rope Walk, Bersih Beach, Air Hitam Dalam Educational Forest and more. Therefore, commuters are advised to booking online in advance at BusOnlineTicket.com during holiday season.